Have you ever wanted to live beneath the water's surface with the merpeople? Click here to play! This game gives you the chance to dive to the depths of the oceans to live in an underwater world and discover plenty of underwater treasure! As you'll be living in Triton's watery kingdom, you'll want to get on his good side. Spin him as much as possible as this mighty king acts as a wild. Not only will he replace most other symbols, but he will also bring in up to 7500 times your line bet if you can spin two to five of him across an active pay line. You'll also want to befriend his beautiful blonde daughter. 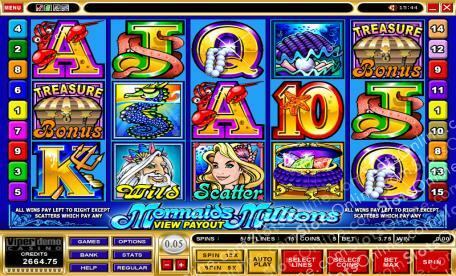 This mermaid symbol acts as a scatter and will not only multiply your total bet, but will also trigger 10 free spins. While you're swimming through this underwater kingdom, you'll need to collect gems, giant clams with their pearls, and seahorses. All of these symbols will bring in some decent wins, so be sure to spin them across the reels. If you're lucky you might just come across some sunken treasure. Spin three to five of these anywhere on the board to trigger the Treasure Bonus that will see you gathering even more cash prizes. Dive to the depths of the oceans to swim with mermaids and mermen while gathering your fortune! The beautiful blonde mermaid acts as a scatter. She will multiply your total bet up to 400 times if you can spin her three to five times anywhere on the board. She will also trigger 10 free spins in which prizes are tripled. Tritan, the king merman, is a wild. He will substitute for all other symbols, excluding scatters, to help you create more winning combinations. If you can spin two to five of him across an active pay line, you'll get 5, 200, 2000, 7500 times your line bet respectively. Spin three to five treasure chests on an active pay line to trigger the Treasure Bonus. During this game, you will get to choose from a selection of treasure chests to reveal your bonus prizes.